openSUSE 11.0 and openSUSE 11.1 both work like a charm. Setting up takes a bit of work. See the User Experiences section on this page for more information. Make sure that the standard openSUSE software repositories are configured: If you don't have a dual layer DVD set with the complete OSS and NON-OSS packages on their, the package manager relies on the software repositories on the internet. I suggest you point to the online repositories (tobe sure) and so you don't need you CD/DVD anymore. Warning: Make sure the standard openSUSE repositories are setup correct before you start installing the software. sudo zypper ar http://download.opensuse.org/distribution/11.1/repo/non-oss/ "openSUSE 11.1 Main Repository (NON-OSS)"
sudo zypper mr --disable-autorefresh "openSUSE 11.1 Main Repository (NON-OSS)"
sudo zypper ar http://download.opensuse.org/distribution/11.1/repo/oss/ "openSUSE 11.1 Main Repository (OSS)"
sudo zypper mr --disable-autorefresh "openSUSE 11.1 Main Repository (OSS)"
Tip: You can manually add things to /etc/init.d/boot.local. After initializing and processing the boot procedure the boot.local script us executed, which can execute the local commands. echo "Need to update the EPG - run mythfilldatabase"
echo "$EPG_DB_DAYS days in your database." Mythfrontend (the integrated mythlcdserver) can control a LCD (Liquid Crystal Display) or a VFD (Vacuum Fluorescent Display) panel through the LCDproc API. LCDproc is a small piece of software that displays real-time system information from your Linux box on a LCD/VFD. The mythlcdserver is started automatically when configured in mythfrontend. You can find the setup options in Utilities/Setup->Setup->Appearance->LCD device display Check the Enable LCD device. Here are some tips that can help you find the best information to configure your hardware specific device information. The LCDproc deamon (?LCDd?) is not started automatically by default after a reboot. The Lirc install still doesn't support the IR Blaster on a Hauppauge PVR150. Due to the number of packages being thrown around, several reboots are needed for things to settle down. 11 sets up XGL/Compiz by default, which may have some affect on how MythTV renders video. This will have to be diddled after the install is completed, and will probably depend on hardware. This guide doesn't cover that. And now, the process I followed. Back up everything you need to back up. This makes recovery a lot easier if things go badly. Boot to the installation media and perform the upgrade. Pay attention to the packages and patterns you are installing. Go through them and verify everything you want is checked. I didn't have any troubles with this, but this is an area where things can go wrong. During the upgrade process it will remove all packages not part of the OS, and not flagged as locked. Since the Packman MythTV packages show up as locked, they'll still be around. We'll fix this later. Log in as Root to your console. Run Online Update to get the latest openSUSE patches, which includes a kernel already and will require a reboot. Add Packman and any others you might need, like the NVidia repo. Search for "myth". Note the MythTV packages you have installed, and explicitly remove them. These are the 10.2 packages and will not work with 11.0. Especially since most of their multimedia dependencies were removed as part of the OS upgrade. Once that is completed, go back into Software Management and reinstall the MythTV packages you removed in the previous step. 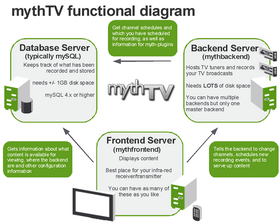 It will give a big list of dependencies required by the MythTV packages; OK their install, and let it go. Once everything is installed, reboot to settle things down. By this point things should be in a good state. From a terminal window, launch "mythtvsetup" and see if it segfaults. If it runs correctly, MythTV as a whole should run correctly. If it does segfault, then this guide has failed you and I apologize. If you are using a Hauppauge PVR150 and its IR Blaster, you will have to compile a "lirc_pvr150" module from source. You already had to do this with 10.2, so the process should be familiar. The update to 11.0 doesn't require any config file changes. Go into YaST and launch System Services. Set "mythtvbackend" (and "lirc" if you use an IR remote) to run automatically, if that's what you do. Log in as your MythTV user and make any Gnome/KDE/whatever changes you need. 11.0 includes significant updates to the desktop from 10.2. In my case I just nuked my profile and began anew. Your mileage may vary. A final reboot to make sure everything is working as planned. The above worked for me, and should be pretty solid for 10.2 to 11.0 while using the Packman MythTV packages. Moosy did several boxes based on openSUSE 11.0 during 2008. As of Mythtv 0.21 version 27 packman got some support for H.264 LATM/AAC required for Norway, New Zealand and possibly some Hungarian DVB-T users. Basic playback works. This is based on a patch from Paul Kendall. Using eVGA 8400GS PCI on a low end HP server (ML110G5 E2160), AverMedia A828 (0.28alpha driver fixed by AverMedia tech support). Note serious bugs still in openSUSE YaST automatic repair - auto repair disks/partitions/raid with extreme caution. Prefer to fix manually. Bugs reported/acknowledged in openSUSE bugzilla. Getting bugs out of mysql install was a pain. Getting an install clean enough to run mysql_secure_installation seems the least painful route (See also config validation script). Old mythTV theme looks and works fine. (New default theme still in the works.) Everything seems to work so far with 1080 source on 1280x720display. Not bad for a cheap media server. Still waiting for 1080 HDTV display to test it on. Should be awesome when 11.2 is final and mythTV0.22 is final and setup can be automated. This page was last modified on 3 December 2012, at 22:03.